March 2, 2019: The first Bay Area Ecology and Evolution of Infectious Diseases meeting is being held at Stanford University. Dr. Andrea Swei is giving a keynote address and Swei lab student, Samantha Sambado is presenting her research on Borrelia miyamotoi ecology. March 1, 2019: Swei lab has been awarded a 3-year NSF grant from the Division of Environmental Biology to study the interactive impacts of climate and large wildlife on tick ecology and pathogen dynamics in Southern California! January 15, 2019: Big Congratulations to Kacie Ring for being awarded the William Simes Research Fund to study host-parasite interactions at the Hastings Natural History Reservation! January 4, 2019: Dr. Andrea Swei is speaking at the CSU Biotechnology Symposium in Orange Grove, CA on vector-borne disease ecology. November 15, 2018: NIH Bridge fellow, Adrian Barrera-Velasquez, is in Indiana to present his summer research on prevalence of Borrelia miyamotoi in central coastal California at the Annual Biomedical Research Conference for Minority Students (ABRCMS) meeting. Best of luck! October 7-11, 2018: Swei lab members and alumni presented their research at the Society of Vector Ecology meeting in Yosemite. What a great place to mingle with vector ecologists! Welcome to the fall semester. We are welcoming lots of undergraduates and a new master's student, Kacie Ring! August 10, 2018 - Swei lab student, Lisa Couper, won best student poster at the Ecological Society of America Disease Ecology section in New Orleans, Louisiana! Lisa presented her Master's work on the gene expression differences of Ixodes pacificus ticks with different host bloodmeal histories. A big congratulations! SFSU professors were awarded 3 of the 6 NSF CAREER awards that were garnered by the entire California State University system! You can read the press release here. It's summer, so that means we are welcoming new and continuing undergraduates to the lab! Welcome to Adrian Barrera, our newest member and an NIH Bridges Fellow! Adrian will be investigating the prevalence of Borrelia miyamotoi, a tick-borne relapsing fever pathogen, in ticks from the central coast of California. Lots to celebrate! Lisa Couper successfully defended her thesis as we wrap up the spring 2018 semester. We also have a lot of new undergrads to welcome into the lab: Eric, Thor, Adrienne, and Sukhi. Lisa Couper successfully defended her Master's thesis on May 15th at 2pm in Hensill Hall room 543. Congratulations, Lisa! This picture was from last year's ESA meeting in Portland, but look who was front and center among the SEEDS fellows? Our very own, Liliana Cerna, undergrad extraordinaire! Reporters from ABC 7 KGO joined us in the field to see how we wrangle ticks and their blood meal hosts. Pictured to the left is grad student, Arielle Crews, checking a western fence lizard for ticks while the news crew looks on. April 6, 2018 -- Swei lab student, Samantha Sambado, received a CDC Center of Excellence in Vector-Borne Diseases Training grant award to study the ecology and epidemiology of an emerging tick-borne pathogen, Borrelia miyamotoi. Congratulations, Sam! The work will fund Samantha's research to better understand the enzootic cycle of this pathogen and will foster collaborations with UC Davis School of Veterinary Medicine's Woutrina Smith and Sharon Brummit as well as the California Department of Public Health. March 19, 2018 -- Skin in the game! 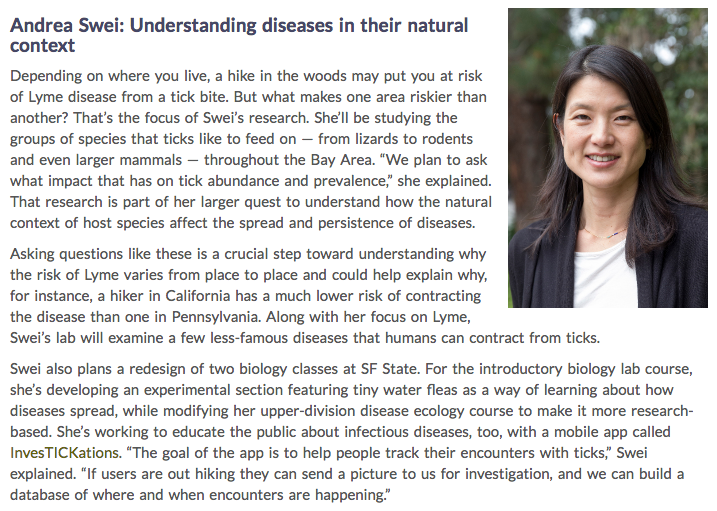 Swei lab tributes offered up our ticks and our arms to KQED Deep Look to get a closer look at how a tick bites. Check out the video here! The full article at KQED Science is also available here. February 6, 2018 -- An NSF CAREER grant has been awarded to Dr. Andrea Swei to study the intersection of host and pathogen diversity in the Lyme disease system. November 27, 2017 -- New paper out in Molecular Ecology by Swei lab alums, Jessica Kwan and Betsabel Chicana, on the changing microbial diversity of ticks and implications for pathogen transmission. Kwan et al. online ahead of print. September 17, 2017 -- Swei lab members, Liliana Cerna and Lisa Couper, helped staff the science tent at the Bay Area Lyme Foundation Polo for Lyme fundraiser. Fall 2017 -- We are welcoming two new graduate students, Arielle Crews and Samanatha Sambado to the lab and also welcoming back undergraduate alum and RISE fellow, Jordan Salomon as a graduate student. Welcome! August 2, 2017 -- Getting ready for ESA 2017 in Portland, OR. Look for talks by Swei lab members and alums: Kerry O'Connor, Lisa Couper, Alex Lawrence, Jess Kwan, and undergrad Liliana Cerna (SEEDS fellow). May 9, 2017 -- Master's student, Alexandra Lawrence successfully defended her thesis titled: "Habitat fragmentation, Biodiversity, and Lyme disease." Congratulations, Alex! Congratulations also goes out to Liliana Cerna for receiving an ESA SEEDS award to attend this year's ESA meeting in Portland where she will be presenting her research on spatial patterns of Borrelia burgdorferi genotype diversity! May 1, 2017 -- This year's field season has begun and the mice and ticks are out and so are the "colorful" field outfits. March 6, 2017 -- The Swei lab received a grant from the Bay Area Lyme Foundation to study ecological factors driving the diversity of Borrelia burgdorferi genotypes. February 18, 2017 -- We had great research presentations from everyone who participated at the Northern California Parasitology conference that took place at SFSU. Congratulations to Kerry O'Connor for receiving the Balamuth-Horen Award and to RISE scholar, Liliana Cerna for receiving the Walter Carr Award! MARC fellow, Jordan Salomon received an Honorable Mention for her presentation. Fall 2016 -- Congratulations to Betsabel Chicana, Swei lab alum on successfully defending her thesis, starting a PhD program at UC Merced, and for winning a student research award at SACNAS. And welcome to new graduate student Lisa Couper on joining the lab! June 20, 2016 -- Congratulations to Enxhi Tahiraj on receiving a Louis Stokes Alliance for Minority Participation (LSMP) fellowship for her research on Borrelia miyamotoi transmission in Ixodes pacificus! May 25, 2016 -- This summer, we are welcoming many new students to the lab including Matt Kumar (NIH Bridges fellow), Jordan Salomon (MARC fellow), Liliana Cerna (RISE fellow). Welcome! March 10, 2016 -- The field season has begun! Mammal trapping and tick collections are taking place throughout the Bay Area! Alex Lawrence and Kerry O'Connor and busy setting up field sites and setting trap lines for catch small mammals. February 6, 2016 -- Congratulations to Jess Kwan for winning the Walter Carr award at the Northern California Parasitologist meeting in UC Davis for her talk titled: "Comparison of Ixodes pacificus microbiome diversity between two different blood meal hosts, Sceloporus occidentalis and Peromyscus maniculatus." January 7, 2016 -- Happy New Year, everyone! A big congratulations goes out to Alex Lawrence for being awarded a prestigious Sigma Xi Grant to support her work on habitat fragmentation impacts on tick-borne disease. And congratulations to Jess Kwan for being awarded an IRA Board research grant! What a great way to start out the new year! November 3, 2015 -- Congratulations to Swei lab undergraduate Liliana Cerna, NIH Bridges to the Baccalaureate fellow, for winning a 2015 SACNAS Student Presentation Award at the annual SACNAS conference (Society for Advancement of Chicanos/Hispanics and Native Americans in Science) in Washington, D.C. Her poster was titled: "Characterizing the distribution of Borrelia burgdorferi outer-surface protein C (ospC) genotypes in Ixodes pacificus and a vertebrate reservoir." Co-authors included Betsabel Chicana, Jessica Kwan, and Kerry O'Connell! Good job everyone! Summer 2015; Swei Lab welcomes new lab members, Jonathan Bertram, Kerry O'Connor, Bill O'Neill, Enxhi Tahiraj, Joyce Ma, Liliana Cerna and Shivang Mehta (not pictured). Research in the Swei Lab is based on empirical laboratory or field data. In other words, we collect ticks and samples from local field sites! It's important to exercise caution when entering tick habitat. We are seeking ticks but they are also seeking a blood meal. So please follow the instructions below on how to prepare for a field excursion. What to bring: Plenty of water for the day and a packed lunch. If you are sensitive to poison oak, also be sure to bring Tecnu and extra water for hand washing. What to wear: The best way to prevent a tick bite is to wear protective clothing. Wear long pants, long-sleeved shirts that are preferably light in color so that ticks can be spotted more easily. Wear hiking boots for going into the understory or interior forest. What to do afterwards: Go home and wash your clothes and shower as soon as possible to minimize the chance of a tick bite. Check your body carefully for ticks. If you find an embedded tick, remove it carefully with tweezers and clean the bite area with alcohol. 10/10/14: Yes, that is an Ixodes pacificus rice crispy treat!